There can be no denying that S&W's Military & Police pistol has been accepted by American shooters. Not only is it being adopted by more and more law enforcement agencies, but civilian shooters are buying them for use as home/personal defense handguns. They are showing up in increasing numbers at USPSA and IDPA matches, where I expect to see them make a name for themselves. So what could S&W do to make this popular pistol even more popular? Well, if the company had asked me, I would have told it to chamber the gun for the most popular of all American pistol cartridges: the .45 ACP. Well, apparently someone must have been reading my mind because earlier this year the folks from S&W unveiled the M&P45. The M&P45's slide and barrel are machined from solid stainless steel bar stock and then "through hardened." Most manufacturers use a case hardening that merely hardens the surface of the steel. S&W's process produces both external and internal hardening. It takes only a matter of seconds to disassemble the M&P to its five basic subcomponents. M&P barrels have a so-called "cone" muzzle that provides consistent barrel positioning--providing enhanced accuracy and less slide friction. On top of the chamber hood is a half-moon cut, which allows the shooter to verify whether or not there is a cartridge in the chamber. Both the slide and barrel receive S&W's proprietary Melonite finish, a heat-treating process that not only protects the surface but penetrates into the metal itself. This provides enhanced protection from wear, solvents, salts and whatever Mother Nature throws at it. Melonite combines with the through hardening process to produce a surface hardness of 68 Hrc. A generously sized extractor claw ensures reliable extraction while its external location makes replacement fast and simple. All M&P pistols come with Novak Lo-Mount sights, one of the most highly regarded sighting arrangements on the market today. For those desiring higher tech equipment, Trijicon night sights are optional. The front of the slide features a unique two-stage, tapered profile designed to ease reholstering of the pistol, especially when the task has to be performed one-handed. Deeply cut serrations at the front and rear of the slide make retraction a cinch, even with wet hands or when wearing gloves. Another nice feature is that all edges of the slide, including the Novak sights, have been beveled to prevent abrasion to the shooter's hands when loading, unloading or clearing a malfunction. A close look at the two steel rails that connect the locking block and sear housing. This provides extra strength while reducing torque and frame flex. Last but not least, a full length, stainless steel guide rod and captive recoil spring ensure smooth operation and consistent lockup and ease the task of disassembly. Breech locking is by means of a system used by many modern pistols. The barrel and slide are locked together by the barrel hood bearing on the front edge of the ejection port, and upon firing, they recoil together for a short distance, whereupon the barrel is cammed down, allowing the slide to continue to the rear--extracting and ejecting the spent cartridge case. As the recoil spring pulls the slide forward, it strips the next round out of the magazine and chambers it. As the slide and barrel go into battery, the barrel hood once again moves up into the ejection port, locking the two units together. The M&P45 comes with three interchangeable palm swells so the shooter can fit the pistol to his hand size. While the top end of the M&P is impressive, it is the design of its frame that really sets it apart from the competition. The M&P's frame features a extended beavertail that secures the pistol in the shooter's hand, dissipates recoil and makes for a naturally pointing pistol. M&P frames are one-piece units made from Zytel polymer and have rigid steel rails imbedded on either side, that run from the front locking block to the rear sear housing block. These not only provide additional strength to the frame itself--reducing torque, frame flex and felt recoil--but also create a chassis that provides consistent alignment of the trigger and sear that is not affected by the expansion and contraction of the frame due to environmental conditions or the heat generated by extended firing. The slide reciprocates on four stainless steel rails, two on the frame-mounted locking block, while the rear pair are part of the sear housing. They are shaped to provide a very small bearing surface which, while still providing sufficient support, reduces friction to improve functioning. At the same time, the setup creates a self-cleaning action that removes debris from inside the frame rails. One of the most attractive features of the M&P is its interchangeable palm swell system. 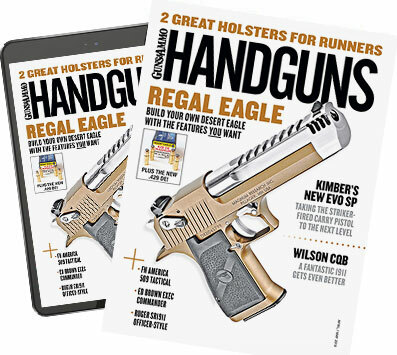 Instead of the shooter having to adapt his grip to the pistol, the pistol's grip is adapted to the shooter's hand by installing any one of three palm swells. To do so, you rotate and remove a catch at the bottom of the grip frame, which allows the palm swell to be lifted off and replaced with one of a different size. Ambidextrous slide stop levers have a flat profile, sit flush with the frame and are located slightly forward of the usual slide stop position. This lessens the chances of the shooter engaging them unintentionally. The magazine release button can be easily changed from port to starboard side to suit lefites. The trigger guard is enlarged to accommodate gloved hands. The M&P uses a double-action-only trigger that provides a 61⁄2-pound trigger stroke with 0.30 inch of travel; it completely retracts the striker before tripping the sear. The trigger pull is exactly the same for each shot, providing consistency and accuracy. An overtravel stop is incorporated and provides a clean-feeling break. While the M&P's long trigger stroke is one of its primary safety features, the design contains trigger, firing pin and magazine disconnect safeties. The trigger safety prevents movement until the pivoting trigger is pulled, while a spring- loaded plunger prevents firing pin movement until the rearward movement of the trigger bar deactivates it. While magazine disconnect safeties have a reputation for adversely affecting the trigger pull, the system used on the M&P solves this problem. When the magazine is removed, a lever at the rear of the magazine well pivots forward, moving the trigger bar out of alignment with the sear and making it impossible for the pistol to be fired. Reinserting the magazine realigns these two units, allowing the pistol to be fired. For disassembly, the M&P's slide must be locked open and a sear deactivation lever at the rear of the mag well must be rotated forward. This means that the trigger does not have to pulled to remove the slide from the frame. S&W is also offering its new .45 self-loader with the option of external, ambidextrous, thumb operated safety levers and a brown colored frame. Known as the M&P45 Dark Earth Brown, it was designed for military forces or police agencies that desire an external safety device on their service pistols. In addition, M&P pistols have a Picatinny rail on the dust cover that accepts all standard tactical lights and laser sights. When I received an M&P45 to evaluate I was a bit shocked to find that the grip felt the same size as my 9mm M&P. When I queried S&W's Joe Bergeron about this, he told me that the only changes made to the basic M&P design were to increase the front to rear dimensions of the grip frame by .001 inch to accommodate the longer cartridge, and use a slightly longer barrel and slide to get the best performance from the .45 ACP round. I contacted my good shooting buddy, Butch Simpson, to help me with the range work. And since he has a knack for it, I let him perform the accuracy testing, the results of which can be seen on the accompanying chart. The M&P45 not only printed to point of aim with all five types of ammunition, it proved to be a remarkably accurate pistol in the bargain. In fact, Butch came awful close to printing one-hole groups with the .45 handloads and Speer hardball. After chronographing all four loads, we got down to really seeing how the big-bore M&P performed. Using a mixture of ammo, we each ran it through several offhand drills on a pair of D-1 targets, drawing from a CQC SERPA holster. We had no trouble whatsoever making holes in the higher scoring parts of our respective targets. Considering neither of us had ever fired this pistol before (in fact, Butch had no experience with any M&P) we found the results of this expenditure of ammunition quite pleasing. d Police pistol in .45 ACP is--like many .45s--a handful. But it's an accurate handful, a reliable handful, a well-made handful and a thoroughly pleasant shooting handful." In the course of testing the M&P we had no malfunctions, either mechanical or ammo related, even though we used a variety of bullet configurations. Lead semi-wadcutter hand loads, jacked hollow point and hardball ammunition fed with nary a snag. If you are of the "bigger holes are better" school of thought, you definitely should consider the Smith & Wesson M&P45 the next time you 'need' to buy another handgun.